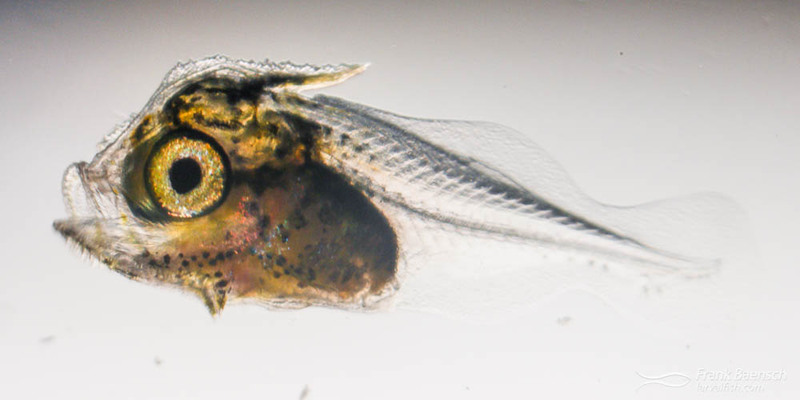 Glasseye (Heteropriacanthus cruentatus) larvae were raised from wild-spawned eggs at 77-79F on wild copepods and artemia. First record of Glasseye culture. Bigeyes (Priacanthidae) are nocturnal, carnivorous, mostly red, medium sized (up to 12” long) reef fishes comprising 4 genera and 18 species. Most species occur in relatively deep water and some species have commercial value as food fish. Bigeyes are not cultured in captivity. Adult Glasseyes (Heteropriacanthus cruentatus) on a reef in Indonesia. The glasseye (Heteropriacanthus cruentatus) was reared from a small number of eggs collected in waters off the west side of Oahu in May, 2012. The eggs are pelagic, spherical, measure about 0.75 mm in diameter and have an amber-colored oil globule. Glasseye (Heteropriacanthus cruentatus) larvae reared in the laboratory. Features of the larvae include large eyes; a large, broad head; a long, serrated preopercular spine, a well-developed supraoccipital serrated crest and spine; and yellow and brown pigmentation. The larvae are hardy and appear easy to raise, especially in the later stages (post-flexion). Unfortunately, later stage larvae also have tendency to overfeed (on artemia nauplii) and died before completing transformation. DNA barcoding helped identify the species.